Since ancient days it’s been traditional to celebrate at harvest-time. All the hard work put in by farmers and gardeners has – weather permitting - been repaid with a fruitful crop, and even today, many villages or parishes mark the end of the season with a Harvest Supper. When it comes to seasonal food, harvest really is the peak time! We’ve recipes here for two tasty harvest dinners. One is a vegetable stew, using loads of lovely freshly-harvested vegetables while the other serves the traditional harvest goose with roasted root vegetables. This can be served as a side dish but it’s so good it’s worth having as the main course. Place the aubergine and courgette slices in a colander and sprinkle with salt. Put a plate on top, weighted down so it’s pressing on the vegetables. Leave to stand for an hour or so to allow the bitter juices to seep out. Rinse well with cold water and pat dry with kitchen towel. 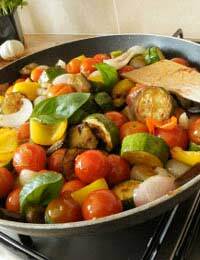 Heat a generous quantity of olive oil in a large frying pan and brown the aubergine. It will absorb lots of oil so add extra as needed. Remove the aubergine from the pan and brown the courgettes on both sides. Set aside. Fry the onion and red pepper until starting to soften. Add the garlic and continue to fry for a few more minutes. Add the tinned and fresh tomatoes and basil. Season well and allow to simmer for 30 – 40 minutes. Serve with freshly cooked pasta and a dish of grated cheese for topping. Prick the goose all over. Now you need a large saucepan – one big enough to hold the goose. Place some water in it - check you can fit in the goose so the water will just cover it. Bring the water to the boil and place the goose in it. Hold the goose down so it’s completely covered for about 1 minute, then turn it over and repeat with the other side uppermost. Remove from the water and pat dry before leaving in the fridge, uncovered, for about 48 hours to thoroughly dry the skin. When you’re ready to cook the goose, preheat the oven to 200 degrees C, gas mark 6. Remove any excess fat from inside the goose and make a neat parcel, tucking in any bits of skin, and cook, uncovered, on the lowest shelf for 1 hour. Reduce the heat to 170 degrees C, gas mark 3, and cook for another hour. Meanwhile prepare an assortment of root vegetables of choice: potatoes, carrots, parsnips. Peel and cut into large chunks. Place in boiling water and simmer gently for 10 minutes and then drain and shake in the pan. When the goose has been cooking for 2 hours, put a roasting tin on the top shelf of the oven and add some goose fat; when this is spitting-hot, toss in the vegetables (carefully!) Roast for about 45 minutes or until cooked. When the goose is cooked the juices should run clear. If you have a meat thermometer, inserted in the thigh, it should register 85 degrees C. Allow to stand for about 15 minutes before serving with the roast vegetables and gravy.